Every week, the Free Babar Ahmad campaign receives messages of support from around the world which not only give us an indication of how much this case has touched the hearts of people worldwide, but also boosts the morals of Babar and his family. We are now requesting supporters to photograph themselves saying ‘Free Babar Ahmad’ and send in their pictures. The pictures can be of you holding a banner, wearing a t-shirt, or even painting your face with the slogan Free Babar Ahmad. The more innovative, the better. We want to try and have as many photographs from as many cities around the world as possible. If you can take your picture at a famous landmark, even better. 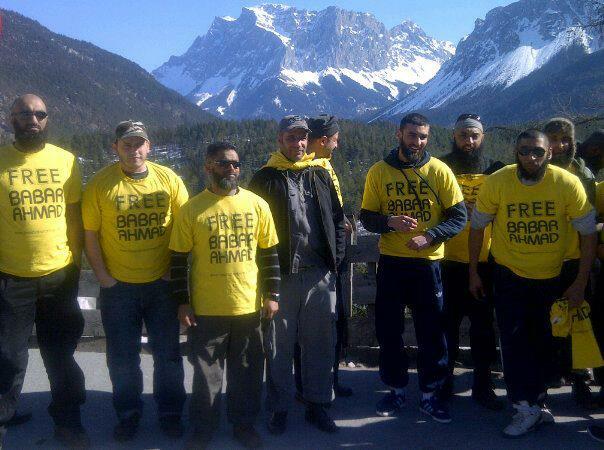 For example, here is a photograph of members of the Aid Convoy to Syria showing their support for Babar Ahmad at the Swiss Alps. All photographs will be posted on to the Facebook Page and sent to Babar. So please start snapping and email your photographs to photos@freebabarahmad.com including the city or landmark where the photo was taken.